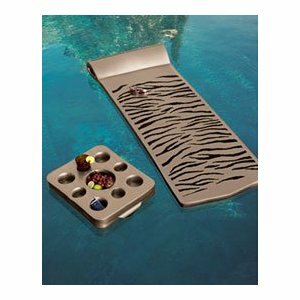 Pool lounging shows its wilder side with this Zebra animal-print pool float. 66L x 26W x 2D. Our floating tray makes the perfect accompaniment; it holds snacks and beverages on one side, or it can be flipped for a game of chess or checkers. Available in Black, Bronze, or White. 21W x 3D x 17L.Beverage insulators keep your drinks icy cold and also fit into our floating tray; available in Black with Animal Print or Bronze with Animal Print. All are made in the USA of vinyl-coated foam.